While ISO is best known for its International Standards, it has other deliverables. Below are the types of deliverables developed by ISO. An International Standard provides rules, guidelines or characteristics for activities or for their results, aimed at achieving the optimum degree of order in a given context. It can take many forms. Apart from product standards, other examples include : test methods, codes of practice, guideline standards and management systems standards. A Technical Specification addresses work still under technical development, or where it is believed that there will be a future, but not immediate, possibility of agreement on an International Standard. A Technical Specification is published for immediate use, but it also provides a means to obtain feedback. The aim is that it will eventually be transformed and republished as an International Standard. A Technical Report contains information of a different kind from that of the previous two publications. It may include data obtained from a survey, for example, or from an informative report, or information of the perceived “ state of the art ”. A Publicly Available Specification is published to respond to an urgent market need, representing either the consensus of the experts within a working group, or a consensus in an organization external to ISO. As with Technical Specifications, Publicly Available Specifications are published for immediate use and also serve as a means to obtain feedback for an eventual transformation into an International Standard. Publicly Available Specifications have a maximum life of six years, after which they can be transformed into an International Standard or withdrawn. An International Workshop Agreement is a document developed outside the normal ISO committee system to enable market players to negotiate in an “ open workshop ” environment. International Workshop Agreements are typically administratively supported by a member body. The published agreement includes an indication of the participating organizations involved in its development. An International Workshop Agreement has a maximum lifespan of six years, after which it can be either transformed into another ISO deliverable or is automatically withdrawn. Guides are just that. They help readers understand more about the main areas where standards add value. Some Guides talk about how, and why, ISO standards can make it work better, safer, and more efficiently. Full list of Guides available in the ISO Catalogue. This brochure offers delegates and experts a quick reference to the ISO system and its processes. 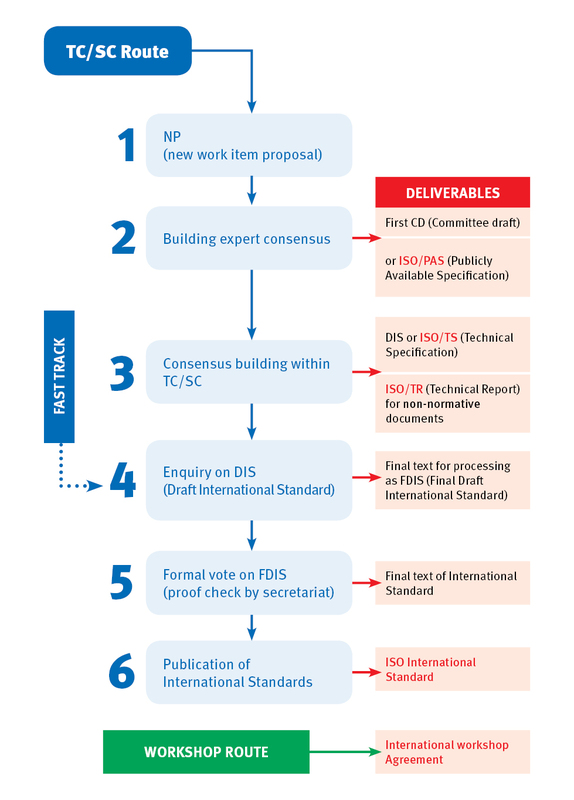 More information about these deliverables is available in the ISO/IEC Directives, Part 1.